Today I have seen Amanda again! She's a squirrel that has been living in my neighbourhood for nearly a year now. She moved here just before the winter and it didn't take her long before she became the keeper of the park across the street. During the winter months she regularly scanned the territory for possible intruders and since there weren't any around to threaten her position of the local queen, she decided to stay. Every week she had her regular picnic in (now officially) "her" park, where she would (after eating as many nuts as she could) run around and had her weekly exercise to keep fit (mind you, she's a very athletic squirrel). She never failed to show up for her dinner-and-gym visits. But about a month ago I became worried. There was no sign of Amanda and I was afraid that something had happened to her. However, it turned out that she must have just been on a holiday (perhaps visiting her relatives). At about one o'clock in the afternoon she came running with all her might across the street from the park and headed straight back home. I was glad to see her again, safe and sound. 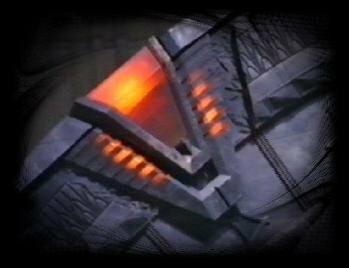 While watching Stargate SG-1 I became interested in the glyphs they have on the gate or on Goa'uld walls. As usual, it didn't remain just at that. I started searching the Internet and ended up learning abour Egyptian hieroglyphs. Among other highly interesting and extremely educational sites I found this interesting Egyptian Name Translator . So, if you want to know how your name would be written thousands of years ago on a wall of an Egyptian pyramid, click the link mentioned above and see for yourself. Have fun! "Oh, what a lovely night! ... Right - straight down to business: bugs and worms! I need some nice, big, fat, juicy bugs right now! I'm starving! ... OK, let's start here - mmmm, nice and juicy - just what I need! ... There, my first worm tonight! ... Hmm, I could do with some fruit now ... I know - I'll go to that little corner over there where that human being always puts some apples for me and MacGyver ... Mmm! Oh, yeah! What a lovely meal! ... Wait a second ... Someone's coming! ... Oh, no! It's a cat! And it's heading right towards me! ... ... Aaaaahhhh! I'm being attacked! Help! Help! ... What should I do?! What should I do?! I know - spines up!!! ... No, it's not working! ... Help! Mummy! Aaaaaahhhh! ... Oh, wait, someone else is here! ... Yes! It's the apple-person! ... Get that cat off me! Quickly! ... Yes! She's scaring the cat away! ... Yes! Saved at last! ... Hmm, should I thank the human specimen? I suppose so ... Well, thank you, human specimen! I'd love to stay around and chat but I have to go now! I have a date with my wife-to-be ... Bye! ..."
These were the thoughts of Pety the Hedgehog as recorded live when he was attacked by a cat yesterday evening under my balcony. Yesterday I "indulged" myself again in watching The Eurovision Song Competition . This time I tried to sit in front of the TV completely impartially. However, I didn't last long in my neutral state. After about five minutes I couldn't help myself but to explode with criticism! The singers and bands were absolutely appalling! They had nothing to show but vibrating body parts and bad choreography! Absolutely ghastly! Thank goodness that at least the organisers in Athens saved what was left to save! The opening of the finals was great! I especially liked the part when the two moderators came "flying down" to the stage. The stage itself was also brilliantly prepared: the lightened "steps" as scenery had an absolutely amazing effect! And I think that the part with the special guest at the end was very nice, too. So, all's well that ends well! 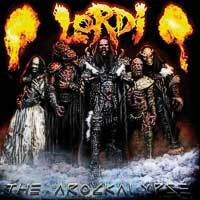 Let's hope that Lordi's CD will be available soon and that there will be some more to come! I was watching The Eurovision Song Contest on TV last night and I was completely disappointed! Not only that - I was horrified! The ways people want to win these days are absolutely pathetic! 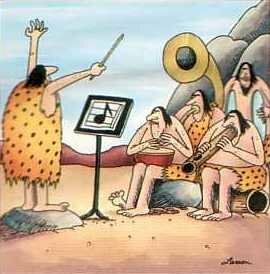 This competition used to be about songs - voices, melodies, instruments. Many songs first sang here beacme evergreens. Dana's song "All kinds of everything" is one such example; Abba is another; and I could go on and on. Even I know (and like!) these songs, although I wasn't born when they won the Eurovision. We can still hear them on the radio today. But unfortunately those good old days are over. Nowadays just about anybody can appear on that famous stage - all one has to do is to be a big enough clown or Barbie doll! The point of the Eurovision is lost. It's not about songs anymore; it's just one big Mardi Gras of screaming specimens! I don't remember any of the songs from yesterday with the exception of two: Ireland (because it was the 1000th song of Eurovision and I must say it was also a very nice song - probably the only one that really deserved to be on this competition) and Finland (just because they had a rather memorable set of "monsters" performing on the stage). The rest was nothing but a mascarade of 20-something creatures, many of which completely missed the point and put on stage something that wasn't even typical of their own country (which, I always thought, was the bottom line of all this!). 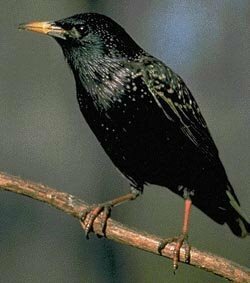 For the past two or three weeks I've been observing a couple of starlings. They moved into our neighbourhood this year and have made themselves quite comfortable in a tree near our house. However, they have taken over all the neighbouring gardens and use them as their feeding ground. Both birds are very lively and they always make sure that there's something worth observing. I've seen numerous bird tricks: from stunt-birds (my doves and the crows) to stealing (the magpies) and drilling into tree-trunks (the pair of nuthatches). Until a few days ago I thought I had seen them all. But the two starlings had an amazing surprise prepared for me. 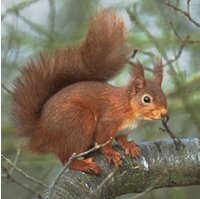 When I was watchig the couple mating in the tree behind our house, I also listened to the strange sounds they produced. I've read that starlings have the ability to immitate other birds. But what I was listening to was not bird-singing... I kept listening and then it hit me: the birds were driving a car! They must have listened to the cars driving along the road nearby. They started making a sequence of sounds (like a formula, speeding) followed by one long high tone (like tires, screeching)! And they kept repeating their "driving", too! In fact their "car-trip" lasted about four or five minutes! It was absolutely amazing! I just had to laugh, because it was exactly the same sound as produced by the cars on the road! Would you believe it!? Every time I mow the lawn, I tread on the grass very carefully. There are so many little creepy-crawlies which are in danger to become minced meat under the blades of my lawn mower. 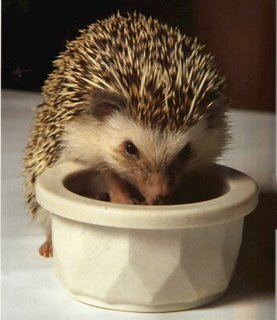 Whenever I see one, I usually pick it up and take it to safety in the hedge. So far, I've saved numerous blindworms, praying mantises, snails, grasshoppers and crickets this way. And every time I do such a noble deed, my generosity does not go unrewarded. With the FIFA World Cup (or whatever the name of the thing that will take place in Germany is) coming up, I decided to write a piece on team sports. They are a funny thing, actually. 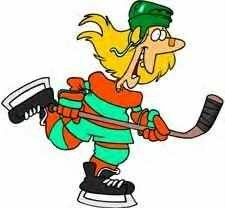 According to many people they "bond, evoke team-spirit in a person, are fun to play" and so on. To me, they are everything but bonding, team-spirit-evoking, fun-to-play activities. Let's take football (or soccer, as it's known in the States), for example. A bunch of old men, running around in shorts, grabbing themselves by their private parts, that never really grew out of their childhood years. Or water polo: a group of men in funny caps, splashing around in the water. Handball: an agressive, leg-stretching thing. Rugby (or football, as it's known in USA): head-bashing, agression-releasing activity with a hord of men, growling and howling around the field. Then, there's also the risk of injury or even death, when a team-mate comes smashing into you with the noble intention of scoring a point for your team. A point just doesn't justify broken bones or even death to me - especially if your team loses at the end! Points of a good greyhound: a head like a snake, a neck like a drake, a back like a beam, a belly like a bream, a foot like a cat, a tail like a rat. Women and dogs set men together by the ears. Q: What dogs became President of the United States? A: Rover Cleveland, Zachary Tailer, Rufferford Hayes, Chester A. Arfer, Dwight D. Eisenhowler, George Bushy-tail, William McKinleash. What does a person have to do to earn this glamorous title? Well, it depends. A good arrest might do the trick. However, sometimes an arrest is not really necessary, as it turned out the other day. We have a peculiar couple living next door. I won't go into a complete analysis now, but let me just say that they are hysterically panicky. Their biggest fear is that somebody will break in through the balcony while they are asleep. So, whenever the lights in the back yard turn on (we have lights in the back yard that have movement-sensors, so they turn on whenever somethig moves in the garden), they jump around like mad and don't go back to bed again until morning. The other night we were up late so we noticed the lights turning on in the garden. Next, we heard wild movement next door. We wanted to know who was outside, so we went to the balcony and ... There they were! Not only one, but two of them, marching accross the lawn! We started laughing. 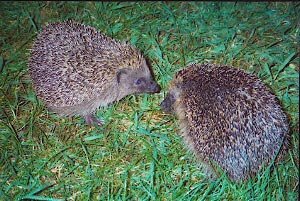 My two hedgehogs (MacGyver and Pete) were running accross the lawn as they do every evening between 10 and 11 pm. Their movements turned on the lights and gave the neighbours a good fright! That sure makes Macky and Pety the police officers of the year in my book! Spring's slowly turning into summer and we all know what that means - tourists! A whole lot of them! Yesterday I went to the city and in a matter of minutes I passed Germans, Australians, Americans and even Icelanders on the street. Some of them were loners and not a part of any tourist-group. However, groups are what's interesting to observe. For example, let's have a look at a group I saw yesterday. It was quite a big group (I'd say about 30 people). Mostly they were retired couples (I think they are really the only ones with enough time and money to travel around already at this time of the year). When I passed them, they were standing in the middle of the square and their tour-guide was explaining something to them. It was about half past two in the aftenoon and it was a sunny day so it was quite hot. Now, picture this: There were these people who (I presume) paid loads of money to come here. You would expect that they would enjoy what they paid for. But instead they stood there, looking like a bunch of prunes with cameras and backpacks hanging on them! I don't understand! Why do such people travel yround in the summer (or late spring) if they clearly can't cope with it? Our country is blessed with lovely weather in autumn, too, and it's not so hot then. They could enjoy the same trip much more! Is it really worth paying a fortune for a journey you can't fully enjoy? As for me, I would never do anything like that! Lady Murgatroid - a loveable, old, home-grown plant. Well, not that old. It's about 3 years old and it's my avocado plant. I grew it from a kernel. 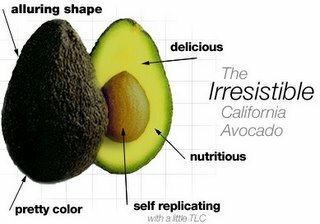 If you want to raise such a plant, all you have to do is buy an avocado fruit. Eat the edible part and put the big kernel from the middle of it into water so that the top (that is the pointy part) is above the surface of the water (this is done best if you stick 3 or 4 toothpicks into the kernel to support it). When the sprout and the little root come out, plant it, give it plenty of water to drink and talk to it, of course :-) This did the trick for me! It takes a long time for the plant to appear (up to 4 months! ), so don't give up! I'm referring to the short, brightly coloured socks (the ones we usually wear in the summertime) with different pictures on them. Many of you would probably think that these are fro children only. Well, I don't think so. Let me explain. So, if you like smiling people around you, wear funny socks! It works! I was in a shoe-store the other day, buying new trainers. I came to the store, kowing exactly what I wanted, got them, paid and left. However in those 5 minutes I spent there, I was a witness to a slave-of-fashion shopping. It's a horrible thing to see! It might even give you nightmares afterwards! A: "Shall I take these?" B: "No, they don't go with that blue Versace miniskirt you bought yesterday!" Gabanna tank top! And I want to wear my Dolce'n Gabanna tank top!!" B: "Well, take the white ones then. I like them." A: "Yeah, I think I will ... But they get stained so quickly! ... Although they ..."
This is just a short part from the horrors I witnessed. How do we buy clothes or shoes? Or, better yet, how are we supposed to buy them? So that we feel comfortable in them? I should think so! Or do we buy them to impress others? If you look around you, what you'll see is a big fashion show! And probably an awful lot of unhappy people who wear those high heels (or whatever fancy piece of clothing they happen to be wearing) just to impress others but they suffer wearing them! Personally I swear on my T-shirts, jeans and high trainers - I don't care if they're not fashionable; they're comfortable and practically indestructible! And isn't that the point of clothes and shoes? The dilema is about mobile phones. Nowadays everybody has them. They range from very cheap to unbelievably expensive ones, from simple ones to those with a million gadgets on them. So, how to decide what to buy? Well, the answer seems to be simple: buy what you need! And if you decide to buy a phone, you probably need it to call others or send text messages. When you finally decide on that, you have to choose the type of phone (and by type I mean whether you want a Motorola, a Nokia or something else) and there's also the price to consider. All this just seems to go on and on and on. At the end you probably end up with the cheapest version possible, perfactly satisfied, and wonder why you bothered so much with a problem that never really was a problem anyway - that is, to buy or not to buy!